steve mcconachie wrote: Great day out,a big thanks to Martin and everybody that was involved for organising the event,roll on the Highland tour! Special thanks to Scotty (I'm nae gonna hing yer baws fae the rear view mirror, crack on loon) and Mark fer sorting Darren oot also anyone else who fed or watered him, (he needs loads). Apologies to Deek for filling his windscreen with a totally sideways and out of control yellow RS that, having just passed him, suddenly realised it was at least 20mph too fast for the corner (and the drivers talent had just ran out) as he came over the top of Macintyres. SOSE stand was spot on and it was nice to meet up with new and old faces alike, especially some of the older members no longer on this site, we're still all car freaks at the end of the day. Pics up when i get round to sorting out the cameras. aye it was a terrific day out thanks - we all had a blast there! even more disappointed not see even one mk4 cortina! craig, susie and the goggle-eyed teen! I just thought i would register on the forum to say how smart your cars looked on Sunday. 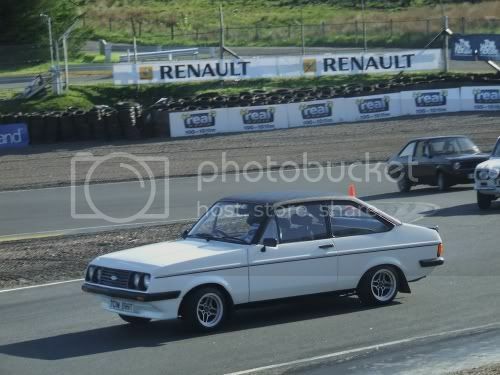 Its been 12 years since I had my last MK2, (FSD187V long since departed to the big scrappy in th sky ) Sunday was pure nostalgia and great to see so many minted cars still surviving . I stil have a lock up full of bits in the hope that one day I will get another one but given the price of mold Escorts now I dont think her indoors would wear it.